That sums it up, but it was much more than that. Some wit coined the term “Guerrilla Filmmaking”, derived from the Spanish word for “little war”. It refers to filmmaking by whatever means necessary. It suggests a people’s rebellion, shock tactics in public places, unpredictable outcomes and secret manœuvres, life and death. I liked the idea of “skeleton” crews armed with lights and a camera, grabbing opportunities without permission, viewing our common world through uncommon eyes. It was all voodoo and very glamorous. I had a poster in my bedroom, a photo taken at the time of The Last Movie (Dennis Hopper, 1971). I was unaware of this film. All I saw was an angry, bearded man in denim, smoking a cigarette and holding an automatic rifle. He reminded me of Karl Marx and Charles Manson. The tagline, “Dennis Hopper is THE AMERICAN DREAMER and the camera is the weapon”, triggered something, but I was unsure what. Swinburne Film & Television School (circa 1980) had a great reputation. It was a rite of passage for many, one that smelled like my grandfather’s camera case. Today, film schools are perfumed with essential oils, pure-wool carpet and the tools of litigation. My grandfather made Super 8 home movies that he screened in a theatrette under his home. It had rows of seats, aisle lighting and a mechanical curtain. Filmmaking was in the blood, but I didn’t even know there was a film school at Swinburne until I heard about some students who set fire to a lecturer’s office. The blaze was extinguished before anyone was hurt and lecturer Nigel Buesst promptly dubbed the accused students, “The Gang of Four”. The original gang of four were Chinese Communist Party officials charged with treason in 1976. In our case, they were Paul Goldman, John Hillcoat and Christopher Kennedy. The final gang member was Evan English, editing on a Steenbeck, cigarettes and coke at hand. Someone told me these troublemakers were involved in kidnapping a frozen chicken from the kitchen of lecturer Peter Tammer. They held it to ransom for a few days before releasing it defrosted into his swimming pool. Their antics attracted me like a fly to stink. I’m an only child and these film people were involved in real brotherhood, working in a collaboration unstained by the black spot of commercialism. They were intelligent but dumb, optimistic and nihilistic, stressed out and driven by a creative urge. I met like minds telling stories with images, as Orson Welles said, “for the mastery of cinema” (2). I liked their pie, and I wanted a slice. 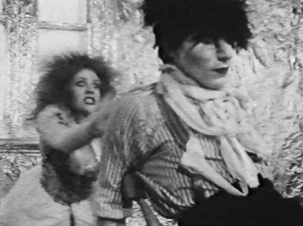 I fell in love with Vanessa Kortlang and danced away the weekends, hanging out with Chris Kennedy and Nique Needles, who lived inside a wardrobe jammed under the stairs of a share house up Glenferrie Hill. After completing my graphic design diploma, Film School head Brian Robinson accepted me into the postgraduate course. I was vain, arrogant, repressed and ignorant: perfect film-school fodder. I suddenly realised I had no idea how to make a film, aside from the fact you need a script, a camera, actors and time. The teaching process in the graduate course seemed very hands-off to me. The lecturers’ “deep end” method required students to delegate roles, grab a roll of 16mm and a clockwork Bolex, read the manual and shoot. I was nervous about the actual step-by-step process of filming. In fact, beyond “Lights, camera, action …” I had no idea what was supposed to happen and in what order. Fortunately, Robert Howard cast me as Walter Logus in The Man With No Cold Drinks (1981). During this time, I had a dream that I was an actor. In my dream, I was standing under a line of arc lights, asking the darkness beyond, “When we start shooting, how many of us are meant to die?” Silhouettes beyond the lights, in a kind of purgatory, offered no answer. Whatever I learned at school I learned from other students, but a little voice in my head was already whispering, “Keep shooting. Button on and keep it on.” Let God sort it out. After Rob showed me what a clapperboard was for, it was time for me to “express myself”. My shortcut to Hell began with the script. My experience of film was mainstream compared to the diploma students, who had a broader knowledge of movie culture. We watched a lot of stuff and I got filled-in fast. I was interested in making a short that referenced La Charme discret de la bourgeoisie (The Discreet Charm of the Bourgeoisie, Luis Buñuel, 1972), The Third Man (Carol Reed, 1949) and especially Alphaville: une étrange aventure de Lemmy Caution (Jean-Luc Godard, 1965). 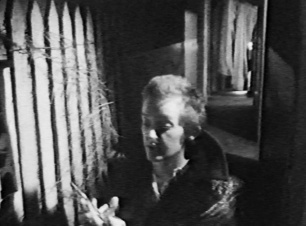 I’d seen Eraserhead (David Lynch, 1977) that year and the anxiety that provoked had a major impact. These movies shared the sense of a dream, with the danger and wonder of worlds displaced by a surreal mysticism. I wanted to emulate these enigmatic films, and all we had to do was point and shoot. I had to write a treatment for lecturer John Bird, reading it aloud to other students to gauge the interest of potential collaborators. During my reading a number of my peers walked out, led by Bruce Kerr, a professional actor who trod the boards. He aimed to bring his skills to directing. Bon voyage buddy. How right he was and how like a red rag to a bull in a china shop. I promptly asked my friends to help shoot a test scene. I cast Tim Skerrit and Frank Trobbiani as the leads, and we shot the final main scene on a rainy night, with great lighting and a smoke machine. The camera was flooded, the scene worked and within a week I got the nod from Brian. It was physical filmmaking, emphasis on the word making – no digital equipment: working a lightmeter, adjusting lenses, walking backwards while shooting, recording with a boom. It was all highly mobile and had great jargon. Magazines were loaded with stock inside a black bag like a magic act. Wheelchairs worked for dolly shots, tripods were heavy and tape recorders reel-to-reel. Exposed footage was processed overnight as the next day’s rushes and sound was manually transferred from recording to cutting tape. My only bloody skirmish was with a sound transfer machine. When the tape finished, the weighted spools kept spinning. I tried to stop them and the spools bit me, tearing the knuckles off both hands. Shaken, I walked out like a surgeon waiting for gloves, blood pouring down my wrists and arms. The women at reception patched me up and I never went near the thing again. I found a William Blake etching, of a man about to climb a ladder to the moon, titled, “I want. I want.” I wrote a new script treatment, mangling it into a supernatural conspiracy about love and loss. I went out at night and found locations where we could conjure dreamscapes. In dreams, we cross mysterious borderlands, down a maze of broken cobblestone laneways, gothic stone haunts invaded by sinuous nature, collecting lost buttons we can never take home, climbing ladders into hideaways where well-known strangers and unrecognisable friends pick at their elbows, watching apocalyptic moons rise with big owl eyes. It was all going to be so simple. My “screenwriting process” had produced several scenes and four characters that needed casting. As far as I was concerned, my film required nothing more than a few friends working a few night shoots and having a picnic at the beach. It was going to be a waltz in the park. Debra Beattie came onboard my little rowboat straight away. Being very courageous, she volunteered to be the producer. I asked Sharon Watson to act; she said, “Yes.” My girlfriend, Vanessa, accepted the role as the heroine and promptly dumped me, which was very professional of her. With my hands bandaged, I was baffled and needlessly heartbroken. My father Mick built the wings for the model seaplane from a knitting machine I found on the hard junk, and a human armature so Frank could fall from the sky. A friend in surgical prosthetics cast Frank’s face for a life mask. My lounge room became a workshop where Tim and I sculpted the seaplane from styrofoam, a toilet-training seat, vacuum cleaner parts and lots of cardboard, toilet paper and liquid latex, our favourite material at the time. Vanessa made her costume from a cloud of white lace, pearls and ribbons that floated around her like a rococo masterpiece. It was all very New Romantic. Debra had a schedule that we stuck to in principle. We intended to cover heaps on the first day. We packed into Brett Ford’s Chevrolet Impala and got to Gunnamatta Beach early. We made a flying rig from a lighting pole and fishing line, marched up sand dunes dressed in costume, built the dummy, hung it on the rig and prepared to shoot. The light changed, the rig bowed, the sun went down. We shot no film except Mariella Del Conte’s roll of 35mm stills, a record of futility on a silvery grey day. The next day went like a dream, getting shots with sunset highlights on rolling lines of waves from the top of Red Bluff. Then we moved to the Moorabbin Air Museum for a night shoot inside a DC3. We had my mum Tena’s sandwiches and permission from my uncle to shoot there. We stopped. “Come out into the light.” It was a policeman, carrying a clipboard and holding an automatic pistol in his outstretched fist. Next day, Brian had a word with me about discretion, which is essential in guerrilla filmmaking. That night, we arrived at an abandoned building on King Street in the city, without permission from anyone. Exhausted by successive night shoots, the crew started setting up. There were generator problems and everything slowed down like miners working underwater. We couldn’t see what we were doing and, after 1am, Sharon said she was quitting. The whole thing fell apart as she walked away down King Street. We packed and left without shooting a frame. Mark Atkin suggested Adam Nankervis to replace Sharon. He was into it. We picked-up the city stuff in my backyard, a maze of dilapidated fences, alleyways, cobblestones and low trees. Outside the pharmacy toilet door, Frank got a ride in the wheelchair, the picket fence made shadows like a Koukalaris and we made Adam’s flaming head from latex, toilet paper and a spray can of gold paint. It was a very late night, but no travelling, no hitches and no cops. Paul gave me a roll he’d shot of a child in a dungeon, rattling an empty birdcage. I now had six characters and the story was still the same. On the final afternoon, Tim and Vanessa came to the Boulevard to shoot their kisses. They were both wonderful, the light was brilliant and they’ll always be that beautiful. It took three days of editing to achieve what lecturer Michael Bladen considered a rough cut. There was no time for a fine cut. I did the sound mix with music by Frank’s band, Plays With Marionettes. I couldn’t afford animation for credits, so Hugo Race read out the crew list very fast. We had a wrap party, with a scarecrow of costumes and the seaplane. I set fire to it at midnight and the thing went up like a volcano. Flames licked the gutter of the pharmacy and I was relieved when the fire brigade extinguished it, leaving the molten knitting machine and charred vacuum cleaner parts. Before Christmas, the Coffin Cheaters motorcycle gang raided my 21st birthday party, but that’s another story. On 10 December 1981, the graduate screening took place. Everyone was invited. Tim blew a trumpet as my film began – a clarion call, angels singing in my ears, my heart pounding. Afterwards, Bruce Kerr, who’d led the charge to the door when I read my original idea, told me, “You created the most striking images up there.” I hoped my parents got it, but I’m not sure. Five years later, I directed my first music video. I found myself holding onto a long plank cantilevered over a tall ladder, with a pretty girl strapped to the end, floating in front of a blue screen, wearing a silk dress. She was fond of going without underwear, and there was no avoiding what I beheld. Meanwhile Elsewhere will screen in “Post-punk Mixtape #2” at the Melbourne International Film Festival on Thursday 30 July at 7:00 PM. National Film & Sound Archive collection search, Title no. 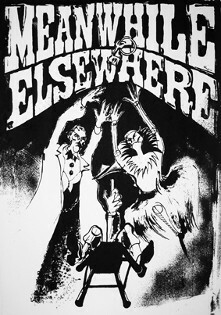 1250, Meanwhile Elsewhere c. 1981, directed by Hugh Marchant. Welles quoted in the 1995 documentary, Orson Welles: The One-Man Band, directed by Vassili Silovic and Oja Kodar. Hugh Marchant is a designer and writer working in the Australian film industry. He has lectured in Media Theory at Swinburne University and worked in the Art Department on feature films, music videos and television. He has received grants for scriptwriting and is involved in developing screenplays.